The Bury Society has awarded our Bury St Edmunds Apex auditorium an Award for Excellence. At a ceremony held on 2nd June at Bury's Athaneum to mark the 40th anniversary of the founding of the Society, Chairman Sarah Green presented Jim Greaves with the Award to recognise excellence in the "design, engineering and acoustic quality of the Auditorium". The opening of the Apex last October marked completion of our Arc scheme for Bury's former Cattle Market site. 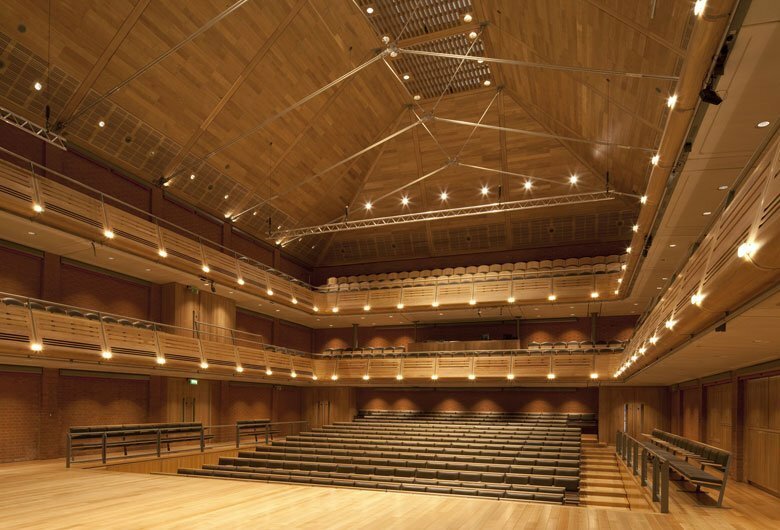 The multi-purpose public hall has a moving floor so that a wide range of performance configurations can be realised, all with state-of-the-art acoustics, and its civic function is key to making the Arc scheme a proper piece of mixed townscape. Ten years in the making, Arc would never have been built without the support of the townspeople, and an extensive and tireless public consultation was undertaken to ensure that the scheme would have that support. As one of the key stakeholders consulted, the Bury Society played a prominent role during the process, and we are delighted that it has been moved to recognise the efforts of all involved in the creation of the Apex.